The rugged landscape and emerald green nature of Scotland and Ireland leave many travellers longing to jump on the next flight to explore these two fantastic countries. However, planning a trip to Scotland and Ireland takes a bit more preparation than simply booking a flight and packing a bag. While these two countries are, on the whole, quite easy to travel in — especially if you’re an English-speaker — there are a number of things you need to be aware of when visiting the wild north of Great Britain and the Emerald Isle. Before we left on our amazing road trips through the Scottish highlands and the west of Ireland, there are a number of things we wished we would have known. To help you avoid some of the mistakes that we made, we’ve compiled a handy list of ten helpful tips to make planning a trip to Ireland and Scotland as smooth an experience as possible! While it is certainly possible to get around Scotland and Ireland while relying solely on public transport, the further out of the bigger towns you get the more difficult it will become. If you don’t want to spend the majority of your days either on a bus or waiting for one, one of the biggest Scotland and Ireland travel tips I could give is to hire a car. Depending on where you rent from and what kind of transmission you prefer, you find a car for roughly £25-30 per day. We recommend searching for cars on RentalCars.com to find the best deal available! While fuel prices can be steep, most cars have quite good mileage and Scotland is a fairly small country, so you won’t have to fill up often. Hiring a car will definitely allow you to see the sites you want on your own terms and gives you a certain amount of freedom that the bus just doesn’t. It is worth noting that both Scotland and Ireland drive on the left side of the road and it can take some getting used to if you’ve only ever driven on the right. However, it isn’t too hard and many visitors manage to navigate the change without any incidents. If you’re looking for tips about driving in Ireland for tourists, make sure to tell the rental car company your qualms and they are sure to help you out. It is also worth spending the time in the car park to familiarise yourself with the car before hitting the road. Another thing to keep in mind is that the majority of rentals cars in Ireland and Scotland tend to have manual transmissions. If you are confident driving manually, hiring this kind of car can save you a fair amount of money per day. There are fewer automatic transmission cars available and they, therefore, tend to be a bit more expensive. However, if you don’t drive manual or are nervous about driving in Scotland or Ireland, then it might be better to get rent an automatic. Camping has long been one of the saving graces for the budget-conscious traveller, with campsites coasting a fraction of the price of even the most discounted of hostel dorm beds. However, in Scotland, while you can certainly drop about £8 per night on a campsite plot, you don’t have to pay a thing if you choose to wild camp — and it’s perfectly legal almost everywhere. Wild camping is both a really good way to offset the cost of a car hire and an excellent way to get away from it all and to enjoy the stunning natural scenery all to yourself. So, if you find a good spot, go ahead and pitch a tent and spend the night — this is one of the best Scotland travel tips I could give. If you do choose to wild camp in Scotland, just make sure to do so safely and respectfully. Exercise leave no trace practices and make sure you leave your sleeping spot looking as if you were never there. Make sure to camp away from main roads, as well, and be sure that it is legal to park your car where you are overnight. If you are unsure if you’re allowed to camp somewhere, a quick Google search for local laws should set your straight. This tip applies only when planning a trip to Scotland as wild camping is illegal in Ireland. However, camping is still a popular money-saving option in Ireland, you just need to be at a proper campsite in order to do it. As a number of people choose to camp in Ireland, there are hundreds of campsites throughout the country and they rarely cost more than about €10 per night. You also get the added benefit of shower facilities…which isn’t offered if you’re wild camping! 3. Take advantage of petrol stations. The Highlands of Scotland is the most sparsely populated area of the UK and larger towns become few and far between the farther north you venture. This is much the same once you get outside of the bigger cities and towns in Ireland. This being said, I would recommend that you consider filling up your tank when you’re about half full as it can be a long time before you come across a petrol station. No one wants to be stranded with an empty tank in the middle of nowhere, so make sure to take advantage of whatever stations you come across. You don’t know when the next one will come along. Petrol prices can be high in this area of the world, especially if you’re visiting from the United States so that is something to keep in mind when figuring out a budget while planning a trip to Scotland or Ireland. One of the best Scotland travel tips to keep in mind while you’re road tripping through the Highlands is that even though your destination might look fairly close by one the map, it can take a while to get there. This is especially true in the more rural areas, but it can take close to three hours to travel just 60 miles. So make sure to plan accordingly and be realistic about how long it might take you to arrive at your destination. The same goes when planning a trip to Ireland, especially if you decide to get off of the main motorway and enjoy the bucolic scenery of the smaller country roads. We recommend getting off the big roads when visiting both Scotland and Ireland because it will help you find some hidden gems and see parts of the countries that few tourists ever even think to, but this can add to your travel time. If you’re wondering how long it might take you to get somewhere, make sure to check out the travel times on Google maps rather than just looking at the distance. If your destination is 100 kilometres (62 miles) away, for instance, don’t expect it to take an hour to drive there as you might in the USA. It will likely take at least 2 hours to drive there. One of the reason it might take you a while to get from point A to point B while on a Scottish Highlands or Ireland road trip might be due to the narrow roads. The farther away from the bigger towns you go, the roads get steadily more and more narrow — to the point where there might only be one lane with passing places every 100 meters or so. Another thing to know is that there often tend to be a number of sheep grazing on the side of these one-lane roads and they have little concern for oncoming traffic. Michael and I spent about ten minutes at one point trying to get some sheep to move out of the middle of the road and had no success until someone came along and let his Border Collie chase them off. It is a well-known fact that Scotland and Ireland and rainy weather go hand in hand, so one of the best Scotland travel tips I can give is to make sure that you’re prepared to experience every season in one day. The most valuable thing you can remember when planning a trip to Ireland and Scotland is a waterproof/windproof jacket. Even though a day might start out bright and sunny with not a cloud in the sky, it can turn at the flip of a switch and, without the proper clothing, you can end up getting completely soaked. So do yourself a favour and dress appropriately. This might be one of the best Scotland and Ireland travel tips I could give, but if you’re going on a road trip make sure to get off of the main highways! As I mentioned in tip 4 and even though rural backroads might be windy, narrow, and full of sheep, they will also provide you with some of the most stunning natural scenery in the world, with every turn giving way to a gorgeous vista. The smaller roads are infinitely more scenic than the big motorways and will definitely make your Scotland or Ireland road trip all the more memorable. You’d miss scenery like this if you stick to the main highway! While British and Irish food may come with a number of preconceived negative stereotypes, much of the UK and Ireland is actively trying to remedy this and food is much better today than it ever has been. And absolutely nothing is comparable to the incredible seafood available all along the Scottish coast or the wonderful oysters and salmon available along Ireland’s wild Connemara region. Though there are many chippies to be found and the battered and fried fish is out-of-this-world delicious, there are a number of fantastic restaurants where you can get beautifully prepared, freshly caught local seafood. This is one of the most indispensable Scotland and Ireland travel tips I could give. Ireland especially is having its own food revolution with a number of local chefs reimagining their local cuisine and giving it a modern twist. While the city of Cork is most notable for starting this trend, many other Irish cities have followed suit and there are myriad Michelin-starred restaurants throughout the Emerald Isle. Even if these restaurants lie a bit outside of your Ireland travel budget, there are some more affordable restaurants, especially in bigger towns and cities, that serve incredible Irish food that will knock your socks off. Nowhere in the world can you find so much phenomenal whisky in such a small area. There are over 100 single malt whisky distilleries actively producing Scotland’s most popular export throughout the country and it would be a shame if you didn’t take this opportunity to tour at least one distillery and see how this wonderful spirit is made. Ireland is no different and although Irish whiskey dropped in international popularity in the past couple of decades, it is seeing a massive resurgence. There are a number of fantastic whiskey distilleries throughout the country and it is very worth sampling Ireland’s famous firewater. 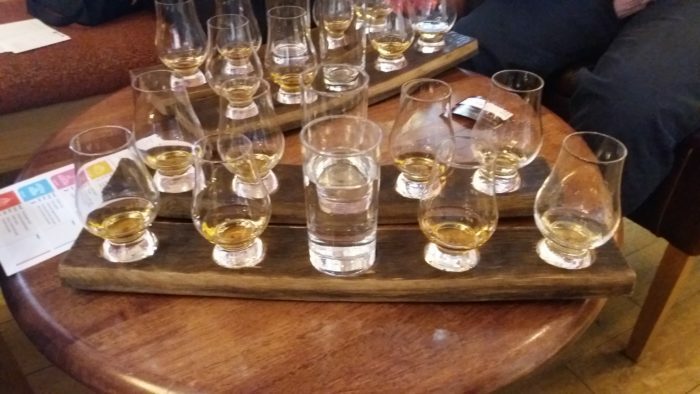 If touring a distillery bores you but you still love whisky, most pubs in Scotland and Ireland have impressive collections of Scotch or Irish whiskey at better prices than you could get anywhere in the world. If you want a great Scotland and Ireland travel tip, head to a cosy pub with some live music and order a peaty dram of a fine single malt. That is a recipe for an unforgettable evening in the Scottish Highlands or Irish countryside. Make sure to sample at least some of Scotland’s fantastic whisky! These ten tips for planning a trip to Scotland and Ireland will help you have the best trip possible. Make sure to take time to get off of the beaten path and enjoy all of the things the Scotland and Ireland have to offer — you won’t be disappointed! Are you planning a trip to Ireland and Scotland? Have you been? Let us know in the comments! Great tips! I have been to Ireland 2 years ago and now I’m planning a 3 week trip in Scotland and Ireland. I will definitely use your tips, thank you a lot for sharing. Planning a road trip around Scotland and Ireland in September. First time visiting, thank for the info.